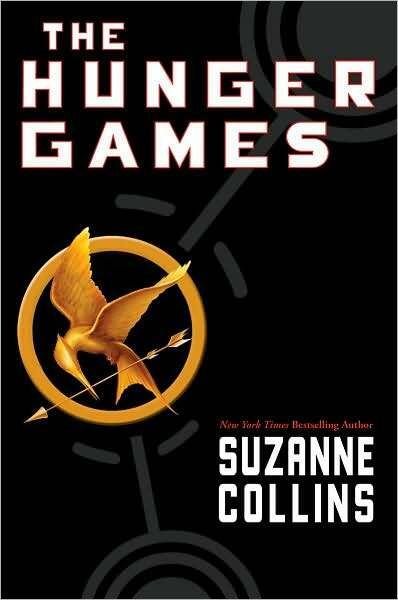 This morning I started reading The Hunger Games by Suzanne Collins. I don’t read much dystopian, but I’ve heard the hype about this almost-trilogy and had to see what it’s all about. I’m currently about halfway through and completely blown away. Ms. Collins has created a world that’s unique—brutal, disturbing, vivid, frightening, and totally fascinating. Her imagery (setting, food, clothing, etc…) is colorfully stunning. Her descriptions of fear, betrayal, pride, and love are spot-on and pull at all the right strings. Her weaving of back story throughout the novel is seamless. What I love most, though—what’s stuck out among all of Ms. Collin’s literary talents—are her end-of-chapter hooks. Three different times today I’ve been reading along and thought I’ll stop at the end of this chapter and get something productive done. On all three of those occasions, I’ve reached the end of the chapter, gasped with surprise, and flipped the page filled with anticipation and (usually) dread. The first time it happened: the end of Chapter One, at the reaping when Primrose Everdeen is called forward to participate in the Hunger Games. The second: the end of Chapter Nine when Peeta declares his love for Katniss at the pre-Game interviews. The third: the end of Chapter Eleven when Katniss realizes that Peeta has joined up with the Career tributes. Each time I’ve read on, gripped with anxiety, dying to find out what happens next, all the while shaking my head in awe at how successful Ms. Collin has been at writing a literal page turner. Now, I’m inspired to go through WIP and ensure that I’ve got amazing end-of-chapter hooks of my own. Isn’t it incredible how with each book you read (good, bad, or otherwise) you absorb something new?